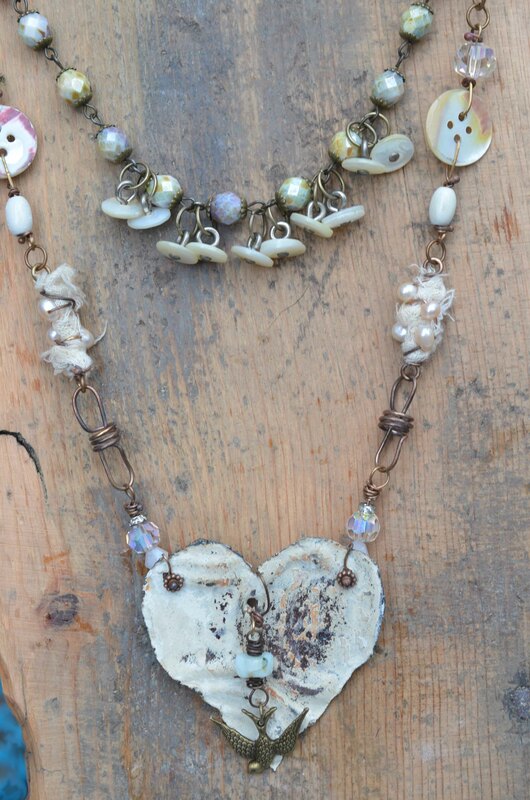 Do you love repurposing old objects into unique mixed-media jewelry? This workshop will focus on jewelry design skills of color, balance, proportion and seeing with your mind's eye (your esoteric third eye or the artist's eye) and also technical skills of improving our cold-connection and wire wrapping skills. Students will learn to safely and properly draw a bead on bronze wire after they've assembled their beads and charms to make beautiful and finished organic wrapped loops, and well as how to make their own rosary chain from vintage beads. Why spend $20 a foot for vintage rosary chain when you can make your own for so much less? 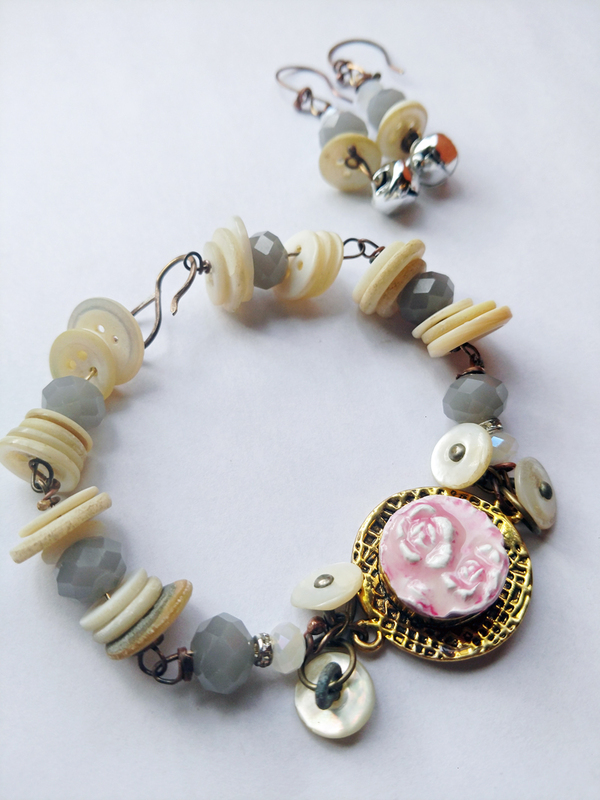 You will make your own clasp and closure, and even create contemporary wire beads, fiber beads and button links to add pops of unexpected mixed-media to your necklace. For instruction purposes we will make multiple clasps, starting with the basic Shepherd's hook and working our way up to more decorative clasps incorporating swirls for a fully integrated design of our finished necklace. For students familiar with wire wrapping or who are fast workers, there may be time to complete an additional bracelet or earrings to compliment your vintage chic necklace. Supplies will be on hand should you find yourself with additional making time. cream silk sari, and all you need to make these projects. We will be working in a lovely cream and bronze color palette. 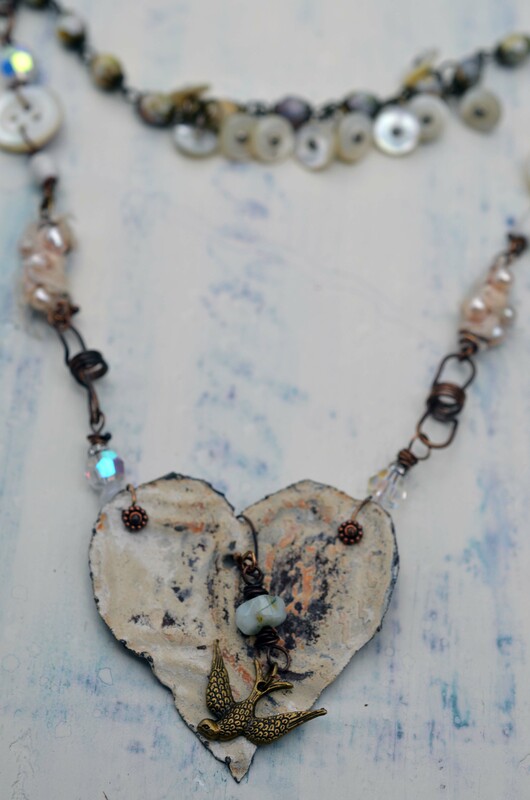 The only thing students will need to bring is their tools and any additional found objects or special beads they might wish to include in their necklace in order to make it their own. If you've been to any of my workshops in the past, you know I enjoy it when students bring their own creative visions to class, along with additional materials or color combinations they have in case they wish to use my sample as an inspirational start to their own designs. A collection of crystal beads and/or pearls for handmade chain if you wish to work with your favorite colors. Instructor will have a cream-colored palette of beads as part of kit. We will be working with jeweler's grade bronze wire that's included in kit fee. If students wish to make silver jewelry they must bring 3 feet of 22 gauge dead soft round sterling silver wire and 1 foot of 18 gauge dead soft round sterling silver wire for use in their own designs. Small found objects (charms, religious metals, broken jewelry bits, metal buttons, etc. you may wish to incorporate into your project.